This work represents a broad-based perspective of the conflict resolution process. While related books have tended to specialize on specific settings, this volume gives in-depth treatment of four various settings--environmental risk resolution, rule-making in the public sector, consumer disputes, and contracts and the courts. It also examines future models for resolving disputes. With its contributions from both practitioners and theorists in the art/science of conflict resolution, this volume properly emphasizes the important role that public policy plays in the settlement of societal conflict. The first section of the book deals with dispute resolution related to environmental issues. Articles in this section address negotiations in the area of hazardous waste, present a review of the timber, fish, and wildlife policy negotiations of Washington State, and examine environmental regulation in the Reagan era. The second section focuses on consumer disputes in two areas--utilities and those exposed unwittingly to asbestos. The third section discusses contracts and the limitations of courts as a higher authority. The fourth section reviews negotiated rule-making in administrative settings. The final portion presents a modern approach to dispute resolution using decision-aiding software. 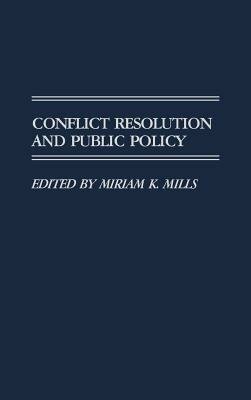 This book serves as valuable reading for anyone interested in the interconnected fields of dispute resolution and public policy.